ALTHOUGH riding high on the revival of rock and roll, Brisbane band INTERCOOLER finds it difficult to be associated with the new scene. After all, Intercooler has been at it since 1996. ``We don't consider ourselves to be a huge part of this new rock scene,'' drummer DAMON COX said. ``We obviously really love that style of music but we don't strive to be a part of that scene. I think it has a lot do to with timing, but I do think it has definitely allowed us to get a bit more recognition.
'' 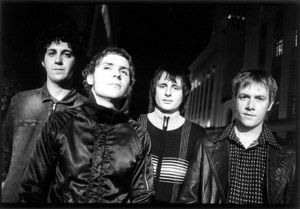 Such recognition has seen the band embark on a whirlwind of tours in the past year, supporting the likes of THE BUZZCOCKS, TEENAGE FANCLUB, THE CELIBATE RIFLES and appearing at the BIG DAY OUT in Brisbane. The band has embarked on a tour with THE CASANOVAS and will perform at the NORTHERN STAR HOTEL on Sunday. ``The year has been really busy for us because we've been out on the road every eight weeks and after this tour we're going over to the States for three weeks.
'' The three-week tour will see the band complete 20 dates including a slot at the SUMMER JAM FESTIVAL alongside US band 3 DOORS DOWN . Cox said the band will get into some serious songwriting when it returns from overseas. ``I think we're going to take some time off and get back into writing again for a few months.
'' "The only way that we're going to get the chance to do it is we take some time off but we keep getting tours thrown at us, so we're going to have to stop taking them or we'll never get the time off to write.
'' InteIntercooler released Old School Is The New School last October.